The Agahozo-Shalom solar field. Photo credit: Gigawatt Global. In sub-Saharan Africa, where much of the population – nearly 70 % — lacks access to electricity, Rwanda is breaking the mould – and taking significant strides toward reducing domestic energy poverty with one of the region’s most ambitious renewable projects. 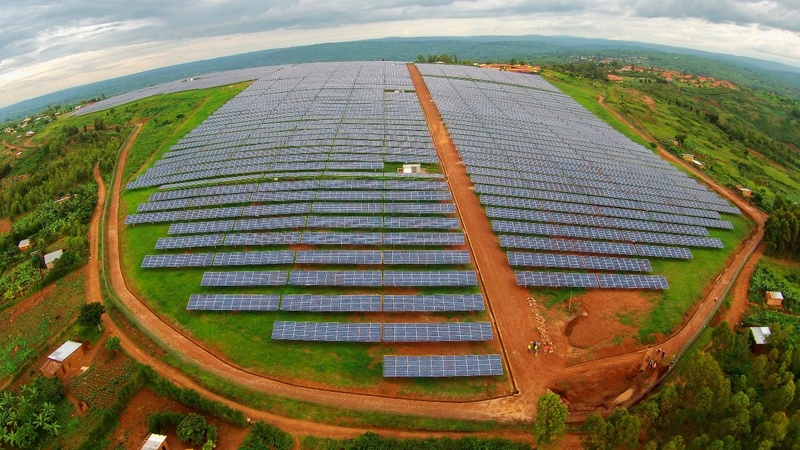 Just 60-miles east of Rwanda’s capital, Kigali, is East Africa’s first utility-scale solar plant – a 17-hectare site with 28,360 panels constructed to form the shape of the African continent. Built on land leased from the Agahozo-Shalom Youth Village, a residential community for children orphaned before and after Rwanda’s 1994 genocide, the 8.5 megawatts (MW) solar plant is currently providing electricity for nearly 15,000 households – and has increased the country’s generation capacity by 6%. The $23.7 million (£16.5 m) Agahozo-Shalom solar plant is the result of a joint bid presented to the Rwandan government by Gigawatt Global, California-based Scatec Solar, and a number of international partners including the Netherlands Development Finance Company (FMO), the UK-based Emerging Africa Infrastructure Fund, and the Norwegian Investment Fund (Norfund). Grants were also provided by the U.S. Government as part of President Obama’s Power Africa initiative, launched in 2013. The Chinese-built photovoltaic solar panels at Agahozo-Shalom rotate to track the sun’s east to west movement across the sky – increasing efficiency by 20% — and the facility is currently connected to a central server in Oslo, but operations can be monitored from any place on earth, via the internet. However, most impressive is the time it took the project to go from inception to operation – construction began on the Agahozo-Shalom solar facility in February 2014 and was finished by July – a process which also provided 350 jobs. Sub-Saharan Africa has tremendous renewable energy potential — particularly for the development of the solar industry. The continent’s potential solar capacity has been estimated to be as high as 10 terawatts (TW), according to the Africa Progress Panel’s 2015 report. Yet, sub-Saharan Africa is still inexplicably held hostage by energy poverty – especially in rural areas, where the electrification rate is only 17%. In Rwanda, less than a decade ago, in 2009, the national electrification rate was only 6% — and barely three years ago, in 2013, while the Agahozo-Shalom solar plant was still just a pipe dream, the country was generating only 110 MW a year for a population for nearly 12 million — and nearly half of those megawatts were from diesel fuel. The lack of access to electricity in Rwanda and across sub-Saharan Africa is a poverty trap – catastrophic for the environment, African economies, and human health. The inability to connect to any sort of utility grid – especially in rural areas – means many households in sub-Saharan Africa are forced to rely on whatever fuel is available – in many cases, turning to kerosene and biomass, sources which are both costly and inefficient. Across the continent, biomass still accounts for 67% of Africa’s energy consumption, and in sub-Saharan Africa, this overdependence on fuelwood and charcoal is the primary driver of deforestation. Reducing reliance on biomass in sub-Saharan Africa by 50% could prevent the generation of 60-190 million tonnes of CO₂ equivalent emissions, according to the Africa Progress Panel. Overdependence on heavily polluting biomass sources of fuel – like charcoal and wood – also takes a devastating human toll – especially on women and children, as the ones typically tasked with cooking and other household chores. Across Africa each year household air pollution claims 600,000 lives – and half of these deaths are children under the age of five. Counterintuitively, African’s poorest households also end up spending disproportionately more of their income on energy – and often on fuel sources which are unreliable. According to the Africa Progress Panel’s 2015 report, nearly 138 million African households – those living on less than $2.50 (£1.72) a day – are also paying nearly $10 billion (£6.88 billion) a year in energy costs – spending a significant portion of their income on rudimentary sources of fuel and lighting like candles, kerosene and firewood. Lack of access to electricity and poverty are inextricably linked. However, even despite ambitious campaigns on the part of many African governments to increase both generation capacity and access, national and local grids will still not reach all Africans before 2030, according to the Africa Progress Panel. In Rwanda, the Agahozo-Shalom solar field is part of an aggressive plan to do both: make electricity not only more widely available but also more affordable. The Rwandan government aims to connect 70% of the country’s population by the end of next year. Renewable energy projects in sub-Saharan Africa, like the Agahozo-Shalom solar field in Rwanda, are also proving to be a way to overcome barriers to electrification generated by the lack of access to a regional or national grid. Decentralised renewable projects – like wind and solar – can be rolled out quickly, and the technology is rapidly becoming both more affordable and more versatile as innovations born in mature energy markets are integrated into emerging markets in Africa. The emergence of renewable industries in sub-Saharan Africa is also catalysing innovative public and private-sector partnerships — making renewable technology both more accessible and more affordable. In a number of East African countries – like Kenya, Tanzania, and Rwanda — ‘pay-as-you-go’ and ‘rent-to-own’ schemes are allowing previously unconnected rural households to afford otherwise cost-prohibitive renewable technologies like solar panels. In Rwanda for example, the Ignite Power initiative links public and private partners to provide affordable ($1/£0.69 per week) pre-paid, off-grid solar systems with enough output to power lights, radios, cell phone chargers and even televisions. While fossil fuel continues to dominate the regional energy profile, renewable sources are increasingly gaining ground and providing a greater share of East Africa’s grid capacity – especially hydropower. Projects like the Agahozo-Shalom solar field in Rwanda are a vivid testament to East Africa’s untapped renewable potential – and proof that electrification doesn’t have to be an excessively time-consuming or greenhouse gas intensive process. ← Analysis: Is Fox’s acquisition of National Geographic bad news for climate reporting?